slightly oily and full in the body it runs on the tongue. full flavors and a perfectly integrated alcohol. In addition to the forest fruit mug and the slightly astringent dates, he feels like a forest honey. Nose: Sachertorte, dates, herbal notes, linseed oil, blueberry, blackberry, smoky. Palate: Photinia ewwwwwwwwwwwwwwwwwwwwwww, sour cherry, blackberry, stewed eggplant, tabacco, mushrooms, leather, smoke & charcoal. Reminds me many gross things. Body: medium. OVERWHELMING Tertiary scents, not balanced. Finish: long with coffee, tobacco, Bacalhau, brownie and assorted Mushrooms. I'm sorry I just hate mushrooms, this has been a quite bipolarized one and I'm standing in the neg side for sure. A hard pass. Sherry? Porto? Ready to play guessing? It looks like a Dalmore initially richer (I'll let you guess if it's a compliment or not). Then the dried fruits, the honey. It is very aromatic! Blackberry jam. Well rich, juicy, greedy, but never too soft. Cooked fruits. 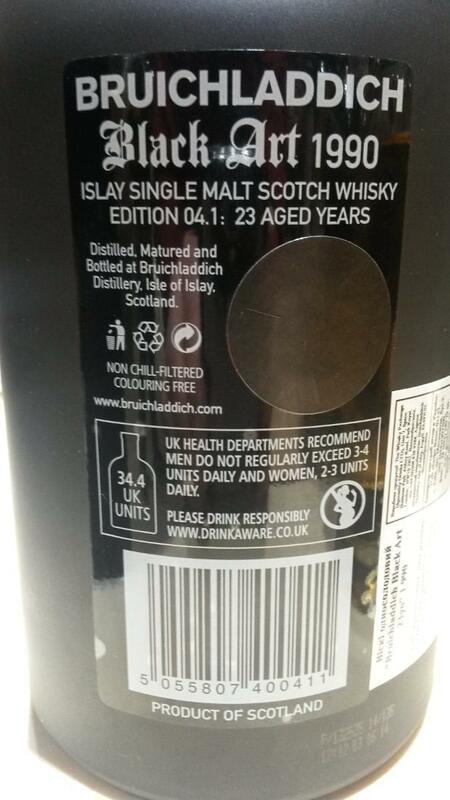 Balanced, although "cask-sided", obviously. Some spices. Very greedy, dominated by red fruits. Nose: Spicy, sweet and a sour vinous and slightly charred wood note can be heard. I also hear a slightly earthy or musty, musty note of wet wood. After some time, an association with acidic wine gums with old oak, as well as sour cherry, roasted aromas and lime peels and some jasmine is also identified. A touch of vanilla as well as an old leather note and burnt caramel come to my mind as well. Taste: Short-term spicy-sweet develops very quickly a dominant tingling acid in the entire oral cavity and lingers there quite long-lasting and strong. Behind it, I find something that makes me think of toasted flavors, plums, oranges with orange peel, some caramel, chocolate and old leather. But I can not identify much more, the tingling acid is always the dominant part of the drop in the beginning and makes it slightly unbalanced. The finish is a little shorter than I like and lingers with some chocolate, vanilla and slightly tart but vegetal oak flavors medium on the tongue. Something like coffee / espresso I do not mean to find, the tart aromas are more direction green tea and musty, old spirit saturated with spirit ( not in the negative sense ). Conclusion: interesting. I really like the drop in the nose, but it gives me something unbalanced on the palate that is too tingly over a tart note. Still not a bad drop, but not a "must have" for me. The Black Art 04.1 was my first Black Art which I had in the glass. This Bruichladdich is and was something special! The fruity nose and the wonderful taste harmonize very well with the intense finish. An unexpected variety of flavors and tastes have made this multi-layered drop into a tasting experience. The black art shimmers in the nosing glass in intense and amber colors. Creamy and oily, the drops spread on the glass wall and run back slowly and cumbersome in the glass. A fine sherry aroma rises from the glass. Dark fruits, dates and light sweetness rise in my nose. A subtle hint of smoke and peat mixes with chocolate, vanilla and a light spiciness. 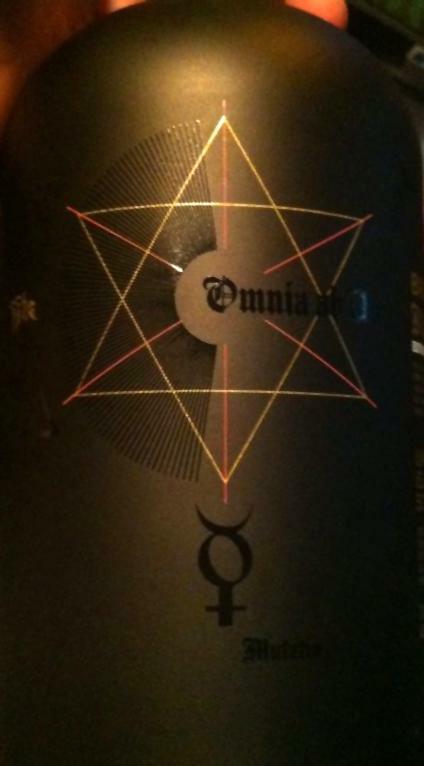 The alcohol is finely integrated and harmonizes well with the nose. At the first sip, a bitter and intense espresso taste fills my palate. Dark chilli chocolate comes to the fore. A pleasant sharpness and an intense woody note alternate. Now ripe fruits and a malty sweetness come to the fore. Again, chocolate pushes forward, this time it's nut chocolate. After this multi-layered taste experience remains an intense and nutty finish, which spreads chubby warm in the mouth. For a long time, chocolate, espresso and dark fruits are remembered. A fine wooden note and again this nutty finish finish this wonderful dram. Wine and sherry notes, grapes, leather, chocolate, mild oak - everything. And yes, the typical musty washcloth - gorgeous! 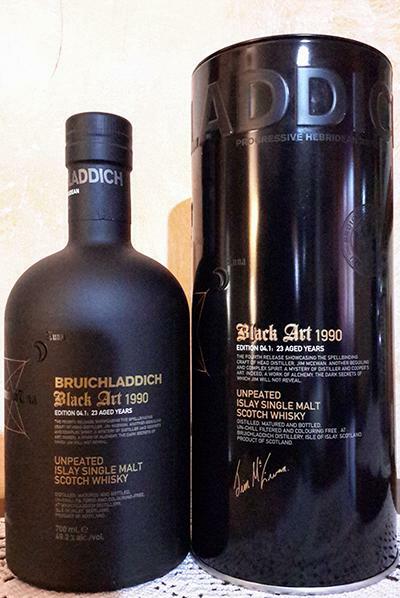 One of the last big Bruichladdich. 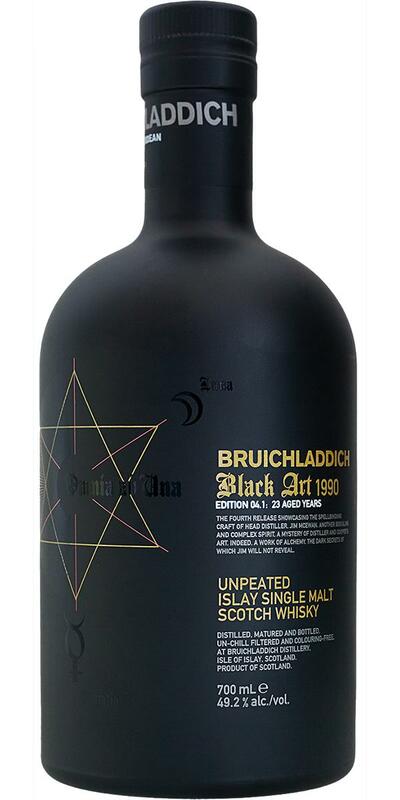 A fantastic malt of 23 years matured in fine barrels - intense, strong, ripe, full-bodied, just delicious! Not cheap but in my opinion worth its price too! Really good! This got layers for ages. With every sip you find something new. The complexity just blows you away. 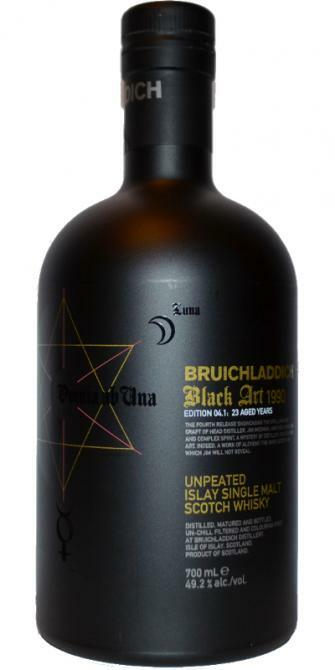 A perfect balance of sweetnes, oiliness, fruitiness and all the million other aspects of this magnificent dram. Big hand to big Jim who used his magic to produce this. Sláinte legend!